The DacMagic Plus has fantastic new features including wireless device connectivity and stunning audio performance from music of all formats. Thanks to twin DACs it instantly improves audio fidelity from all your favourite digital products allowing you to make your computer, TV, Blu-ray player and other devices a true part of your hi-fi system. 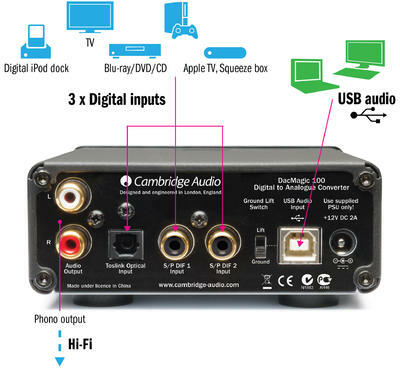 The DacMagic Plus works by taking a direct digital audio signal from your computer, TV or other device - bypassing their built-in digital to analogue converters. This signal is then carefully analysed and upgraded using our ATF2 upsampling system. Once this process is complete, the DacMagic Plus outputs your music as a much purer analogue signal straight to your amplifier. Custom developed by our dedicated team in the heart of London, DacMagic Plus is totally flexible and supports digital music of all formats. It even allows you to upgrade 24-bit music files stored on your PC for better-than-CD performance from your digital music collection. Watch the video opposite to find out why our proprietary ATF2 upsampling technology makes such a difference to the sound produced by our DACs. By linking our plug-and-play BT100 wireless audio receiver to the DacMagic Plus, you can also stream music wirelessly from your smartphone, tablet, laptop or any gadget that supports Bluetooth*. Additionally, if your device supports the superior aptX CODEC Bluetooth encoding, you can stream lossless CD quality music from your device to the DacMagic Plus. As well as controlling and playing music that’s stored on your computer or smartphone, streaming services like Spotify and Last FM can be shared with your hi-fi in stunning quality. "If you are contemplating putting together a high-quality desktop audio system, or adding computer audio to an existing system, you will be hard pressed to find any DAC/Preamp that includes a more useful feature set or better sound for the DacMagic's £350 pricetag. Yes, it's a great value. Yes, it delivers excellent sonics. And yes, the Cambridge Audio DacMagic Plus has earned my recommendation as the new benchmark for DAC performance with a price under £600." "It has an open and revealing character that is strong on timing... comes highly recommended." "...part of the future of digital audio in the home." "...the DacMagic turns the often iffy sound of MP3s into high-end audio." 32 Ohm to 600 Ohm.